Villiers Street is a street in central London that I know well, having walked up and down it many times without giving it a second thought. Going broadly downhill northwest to southeast, it begins at the Strand, alongside Charing Cross railway station, and runs down to Embankment underground station, just by the Thames. With arches housing an old-time theatre and a nightclub on the right as you go towards the river, this pedestrianised street has a faintly insalubrious air. Nowadays it consists mainly of eateries, and I’ve eaten in a fair few of them, stopping for lunch on the way to a matinee at the National Theatre. As I said earlier, I hadn’t given this street a second thought. That is, until I followed a guided walk of Covent Garden that uncovered two secrets about it which will forever give it a special place in my memory. Just as you start to walk down it from the Strand end, there is a lane on the left called York Place. But if you look carefully at the sign it says underneath in much smaller letters: ‘FORMERLY OF ALLEY’. So York Place was once called Of Alley. 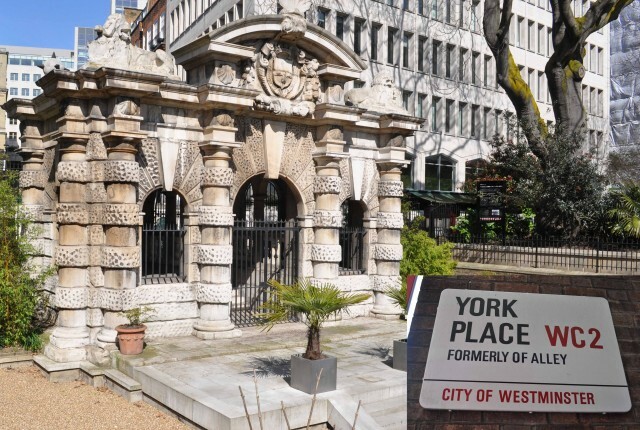 It turns out that York House, the mansion on this site, was knocked down in the late seventeenth century to make way for building plots and that its owner, George Villiers, Duke of Buckingham, stipulated that every part of his name had to be used when naming the streets. And no part of his name was spared, even including that little preposition, giving rise to Of Alley. 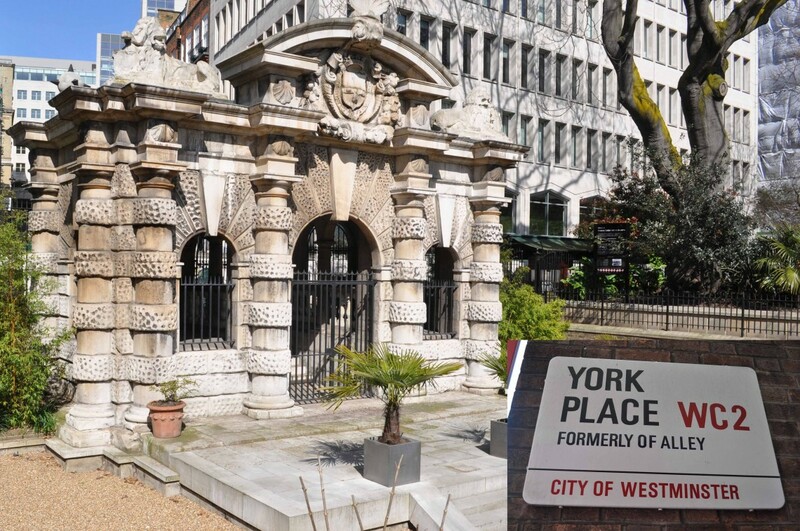 In the twentieth century, Westminster City Council renamed it York Place, but left its former name on the sign as a concession to disgruntled residents. To me at least, it seems a shame they lacked the imagination to leave the old street name in place. Continuing down Villiers Street, you can turn left into another lane, called Watergate Walk. Down a flight of steps and to the right is what was once York House’s watergate, and the last such surviving gateway on to the river in London. As a result of embankment to create gardens in the mid nineteenth century, this watergate is now a good 50 metres from the Thames. But the fact that it led in earlier times straight on to water reminds us that the Thames must once have been as bustling as the Grand Canal in Venice, where the watergates of the palazzi are in constant use to this day. So Villiers Street is not just a mundane thoroughfare, a way to get from A to B – it’s a source of pleasant surprises, capable of suddenly plunging the visitor back into London’s extraordinarily rich and varied past.